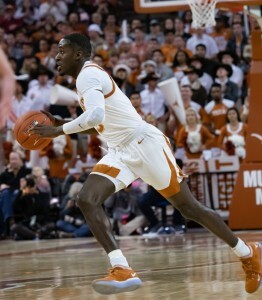 AUSTIN, TX — Following UT’s loss against TCU, head coach Shaka Smart’s team was presented with the unique opportunity to play a non-conference game well into the Big 12 season. They drew a Georgia Bulldogs team that turned the ball over 26 times and still defeated Texas 98-88 behind a sizzling 67-percent shooting effort in Athens on Saturday. Texas, who has lost five of its last six games, now welcomes Big 12 co-leader No. 11 Kansas (16-4, 5-2 Big 12) Tuesday. Getting things back on track against one of the top teams in the country won’t be attainable if Texas repeats the poor defensive performance from Athens. That game in Phog Allen Field House came down to the last possession. Jase Febres’ three-point attempt to win the game was heavily contested and missed the mark. Texas’ only win since that game was days later at home against Oklahoma. Smart believes the season implications behind the Kansas game could be greater than they were when facing the Sooners. Much of what Smart has emphasized during the offseason and the current season was based on communication. After games, he has spoken on how difficult portions of the season have led to difficult, yet honest conversations in the locker room. Smart admitted beginning those conversations is a part of his staff’s role as coaches, but added those conversations are more powerful when it’s player-driven or player-led, naming Dylan Osetkowski as one who has taken it upon himself to begin those conversations. Increased and still-healthy communication is beneficial for a team even in difficult times, but Smart understands that doesn’t matter if it doesn’t result in better outcomes on the scoreboard. Smart was also asked about his team’s confidence level at this point in the season. He said they understand what leads to success on the court and have emphasized those key points, trying to get his team to turn that into habit. Texas’ game against the Jayhawks tips off at 6 p.m. at the Erwin Center and will air on ESPN.